On Saturday, I found the following post on Detroit Tigers Face Book page. 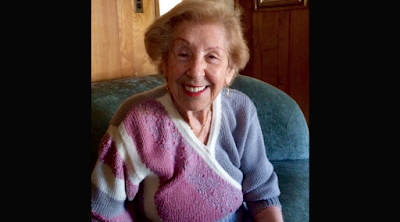 Today's national anthem was performed by 89-year-old Hermina Hirsch, a Holocaust survivor whose bucket list wish was to sing the national anthem at a Detroit Tigers game. How awesome is that! Thank you Detroit Tigers web site and Major League Baseball for this video of Hermina Hirsch fulfilling her bucket list wish of singing the national anthem at Comerica Park in Detroit. Note: For some reason this takes a few seconds for the video to show up on the page. Thank you Detroit Tigers organization for this wonderful gift to Mrs. Hirsch. God Bless Hermina Hirsch! This reminded me of the last year at the Astrodome they picked seniors [from letter requests by the family] to be the "ball boy" on the field, and one of the last "ball boys" ever at the Astrodome was my Dad who was in his late 70's at the time. My Pop was a huge sports fan, and especially a huge Astros baseball fan and this was so great by the Astros organization to give him one of the thrills of his life! 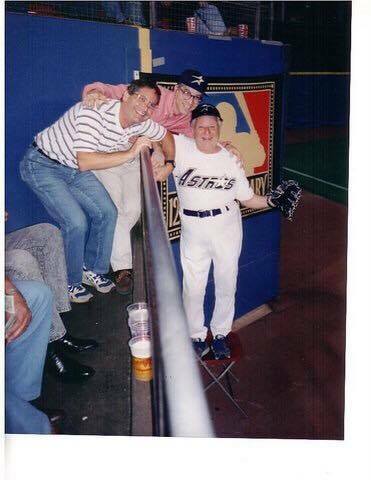 Brother Brad and me get honor of taking picture at the Astrodome with the Astros ball boy! Love you, Pop!